There’s a lot more to hemp’s history (and future!) than you may know. We’d like to share some of the stories of the courageous pioneers, visionaries, innovators, activists and others that stood up to help make American hemp a reality! 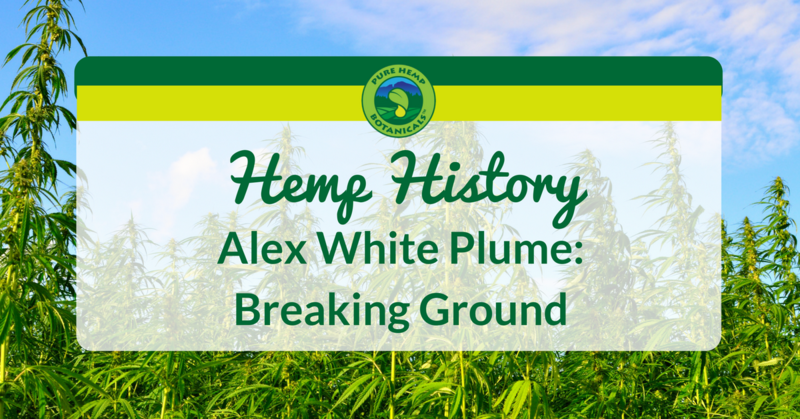 Today, we’re going to share the story of Alex White Plume, and his determination in the face of adversity. In 1998, the Oglala Sioux Tribe passed an ordinance allowing the cultivation of industrial hemp in Pine Ridge. Since then, it hasn’t been easy, but their love and dedication is making waves. After a promising start to their hemp farm and the creation of much-needed jobs in their community, in 2000 the DEA violated the Sioux Treaty of 1868 by illegally entering their land and taking away their hemp crops. In one moment, their blossoming economy was crushed. A federal injunction was put on their family, to never grow hemp again. When the Farm Bill was put into law, it did not include any Native American communities in the conversations or in the ability to participate in the program. Alex White Plume isn’t going to throw in the towel, though. He is still hopeful that the future can be brighter than the past, and believes that there is still much to look forward to in the world of hemp. If we’ve learned anything in life, it’s that his kind of persistence is just what we need in order to make hemp available to everyone. Watch the video to learn more, and see how you can get involved in Hemp History Week!